Rinse the pork belly under cold water. Pat dry with paper towels. Cut into 1 1/2 inch by 1 1/2 inch cubes. The pork belly is easier to cut into even cubes if it is partially frozen. Place the cubes into a large bowl. In a small bowl, combine the brown sugar, salt, rosemary, paprika, garlic powder, and pepper. Rub the brown sugar mixture on all sides of the pork belly cubes. Refrigerate overnight. Remove the pork belly from the refrigerator. Preheat the smoker to 300 degrees Fahrenheit with the lid closed. Place a large wire cooling rack on the smoker grate. Arrange the pork belly cubes side by side on the wire rack. Cook for 30 minutes, lid closed. Reduce the temperature to 250° F (120° C). Cook for 2 hours. In a bowl, combine the BBQ sauce, maple syrup, hot sauce, apple juice, and butter. 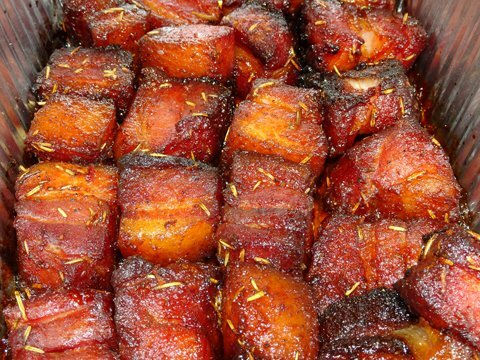 Place the pork belly cubes in a disposable aluminum pan. Pour the glaze mixture over the pork. Toss to coat the pork. Arrange the pork cubes so they are side by side in the pan. Cover the pan with aluminum foil. Place pan into the smoker on the grate and cook at 250° F (120° C) for 1 1/2 hours. Uncover the pan, turn each cube over. Cook for 15 minutes to set the glaze.